I’d first like to welcome our new businesses which have recently opened in town. Noteworthy is that three internationally established businesses have now opened their first USA retail location in SOMI. In speaking with the owners, our community was selected because of its charming characteristics and our area’s demographics. Read more about these businesses and others in our What’s New feature, found on page 40. 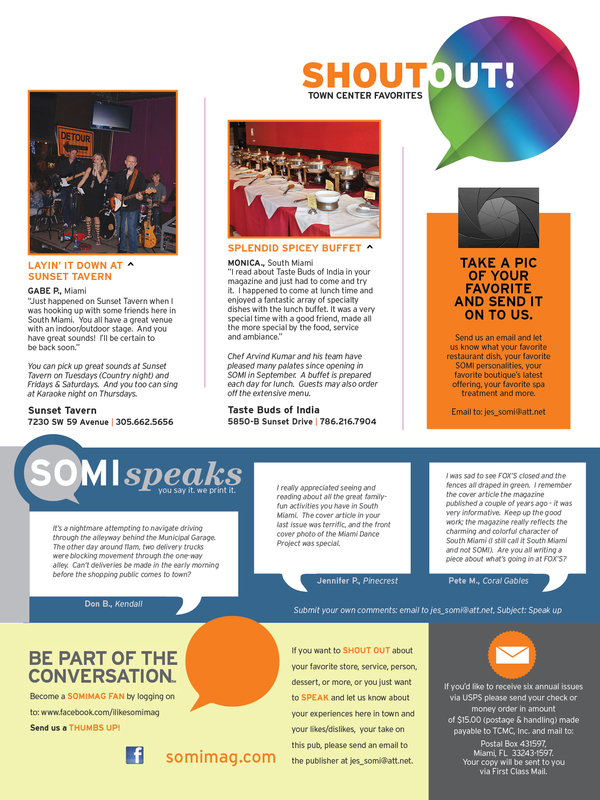 SOMI Magazine continues to present cover features of important community cultural institutions to our readership. The Adrienne Arsht Performing Arts Center celebrates its tenth anniversary this month. Having been very much professionally involved with the performing arts community in the late 1970s and into the 80s, the performing arts center is here today due to the tenacity of certain individuals and the public-private will and determination to build a world class performing arts center in Miami. Job done: congratulations! Close to home, one project which has been a priority in the City of South Miami for the past couple of years is to make SOMI a more pedestrian and bicycle friendly community. Those who know that I am a commuter cyclist also know that this is a passion of mine as well. People first, then cars! Cycling is one aspect of multi-modality solutions. County Mayor Carlos Gimenez has taken a leadership role over several years in addressing cycling concerns, such as improvements to the Rickenbacker Causeway, more bike lanes stripped, and promoting cycling as a good community connector with the adoption of the BIKE 305 initiatives. See SOMI Magazine’s coverage on page 30 of the re-opening of the Venetian Causeway and this year’s Bike-to-Work day. Bike 305 is a collaboration of Miami-Dade County municipalities, the county’s transportation, public works and parks departments and area cycling groups and businesses. The program encourages healthy lifestyles and transportation alternatives. Bike-friendly events that connect bikeways, trails and greenways are held, as well as programs that teach safe-cycling skills to children and adults. I’d invite you to check them out: www.miamidade.gov/bike305. And SOMI Magazine continues to support the development of “The Underline” a ten-mile linear park and trail under the Metrorail. It’s an exciting project and we’re fully committed to promoting this in the community. The Ludlam Trail is a very important recreational trail that should be built. Both great recreational projects, the Ludlam Trail and The Underline are important in building connectivity throughout the area, and very worthy of public and private support to provide an enhancement to our community’s quality of life. SOMIartwalk© finished up its 2015/16 season last month. I’d like to acknowledge the businesses which have participated in the event since October by hosting artists in their establishments; our ArtNight Ambassadors, members of the South Miami Senior HS JROTC, who assist visitors to the community; and the visual and performing artists who have shared their talent with us. Planning for next year is already underway. Visual and performing artists and those who would like to volunteer to make SOMIartwalk© a more memorable experience, please contact us through www.artnightsouthmiami.com.